Hello blogging friends! 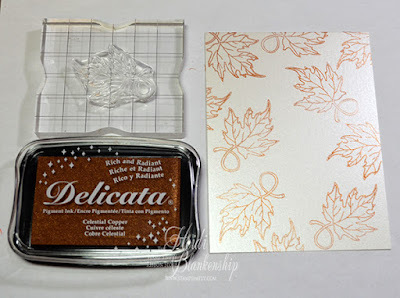 Last week I shared a card and sneak peek with you for one of the New Stamp Simply Clear Stamps and today I will be sharing another card using both of the two new stamp set for the Autumn Release. This past week the design team has been sharing so many beautiful Fall/Autumn cards and projects so please be sure to check out the Stamp Simply Blog. Sharon is having a giveaway over on the blog and you can click HERE to find out all of the details and how you could have a chance to win! 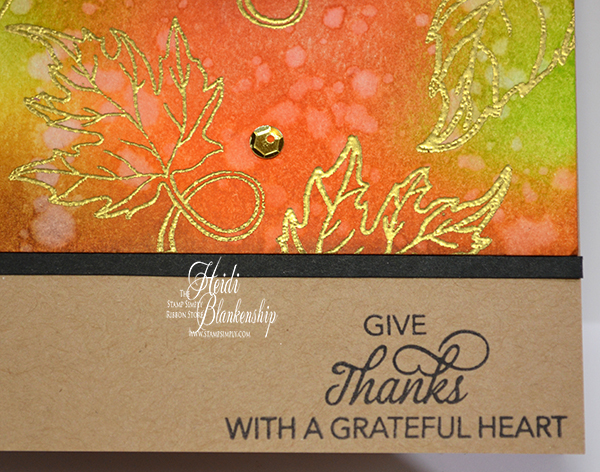 Here is the card I designed using the Stamp Simply Clear Stamps - SS-009 Give Thanks and SS-010 Harvest. I love all of the beautiful verses and sentiments on both of the stamp set. Both sets also have some wonderful images of leaves to stamp and color. 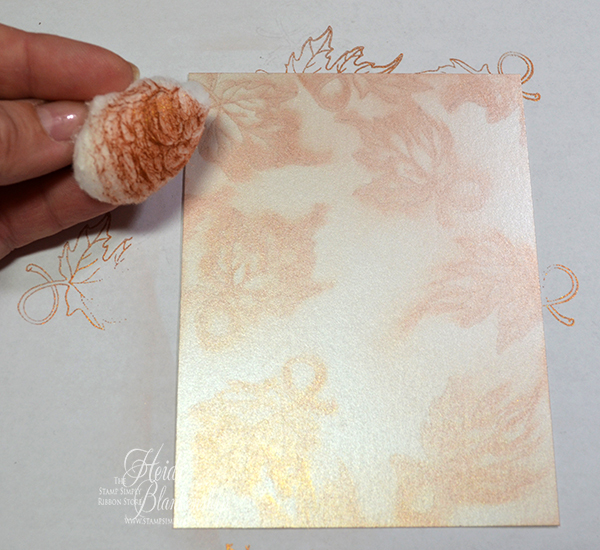 To start I stamped one of the smaller leaf images from the SS-010 Harvest stamp set on to Luxury Pearlescent Metallic 105# Cardstock - Quartz White paper with Delicata - Celestial Copper ink. 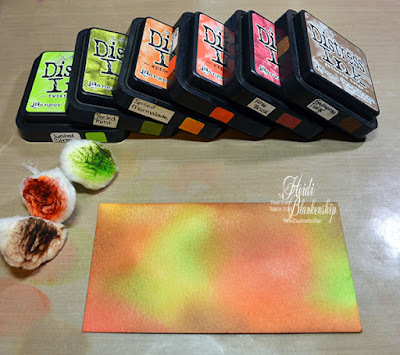 The Delicata inks are a pigment ink but you can do some really fun and shimmery techniques with them. 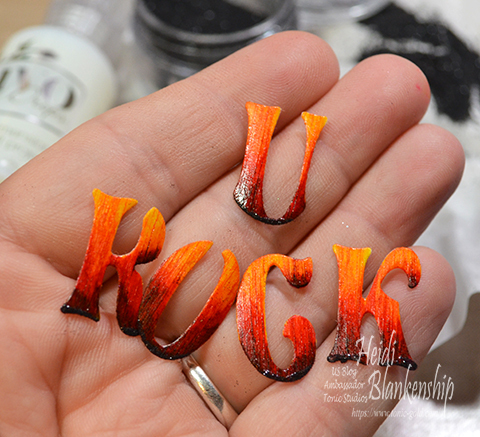 Usually you would add embossing powder to a pigment ink and use a heat tool to melt the powders and heat emboss. But on the pearlescent papers you can use a cotton ball or a sponge to rub and blend the ink into the paper for a very soft and faint image of the stamp. Here is a look at the paper after the ink is blended in. The images are still there but they are very soft and faint looking. I love the results! 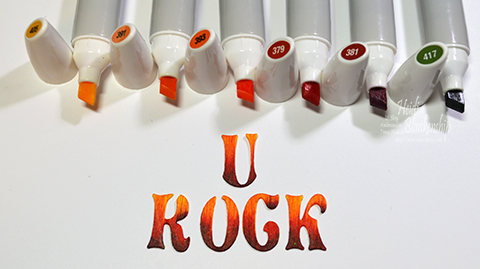 After the ink has been blended into the paper you will need to use your heat tool to make sure the paper/ink is dry. After the paper is dry then I take an anti-static powder bag and rub over the area that will be embossed. Before stamping the larger leaf pour a little of the embossing powder over the paper and tap it off. If all of the embossing powder comes off then your paper is dry. 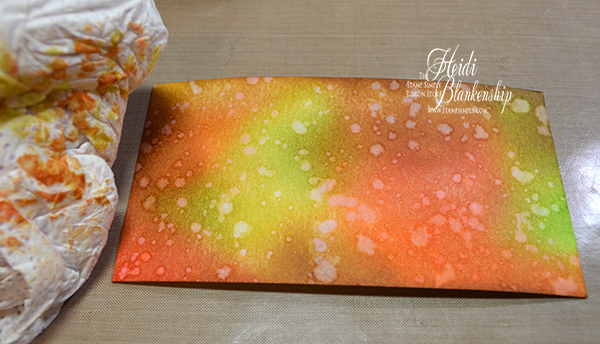 If the embossing powder sticks to your paper then you can brush it off and dry the paper a little more with the heat tool. I stamped the larger leaf image from the SS-009 Give Thanks stamp set towards the upper part of the card in the center. I used the Delicata - Celestial Copper ink and Ranger - Super Fine Detail Copper Embossing Powder to heat emboss the image. 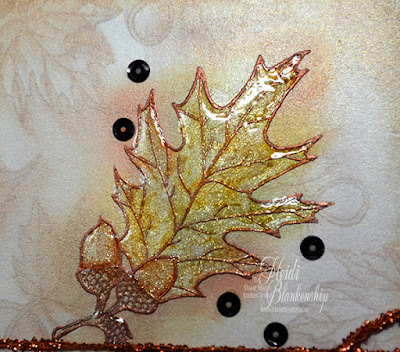 Then I added some color to the leaf image using Tim Holtz Distress Inks. I used a cotton ball to apply the inks. These are the colors of ink I used on the leaf and acorns--Vintage Photo, Brushed Corduroy, Peeled Paint, Spiced Marmalade, and Fired Brick. Next I added a little bit of sparkle to the image using a Zig Wink of Stella Clear Glitter Pen. When I used the glitter pen I just kind of pounced it on to the paper. You don't want to use regular pen strokes to apply the glitter pen because if you do it will lift the distress inks right off of the paper. I waited for the glitter and ink to dry and then I added some Glossy Accents to seal in the shimmer from the glitter. Oh and one other tip just let the wink of stella dry on its own. I tried to speed up the drying time and used a heat tool but when I did that it took away all of the shimmer so I had to apply it again. I'm not sure why that happened but I thought I would share it with you and save you the trouble of having to reapply the wink of stella. Once the glossy accents was dry then I started to assemble my card. 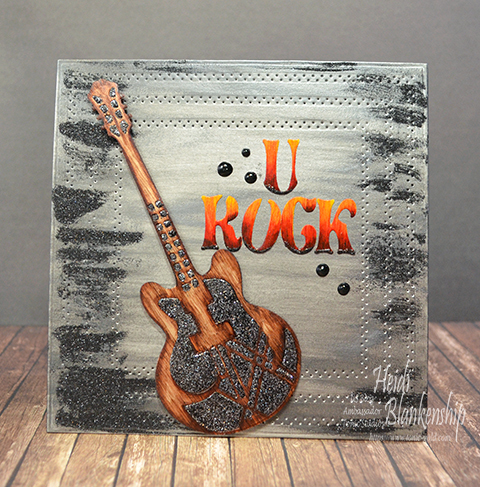 I added a layer of Luxury Pearlescent Metallic 80# Text - Copper paper behind the stamped images. The text paper is lighter weight and great for layering. Then I added a piece of May Arts Metallic String Copper around the middle of the card and just tied it in a simple knot. I added the card front panel to a black A2 top folding card base. I used the same ink and embossing powder to stamp and heat emboss the sentiment on to a piece of black cardstock. 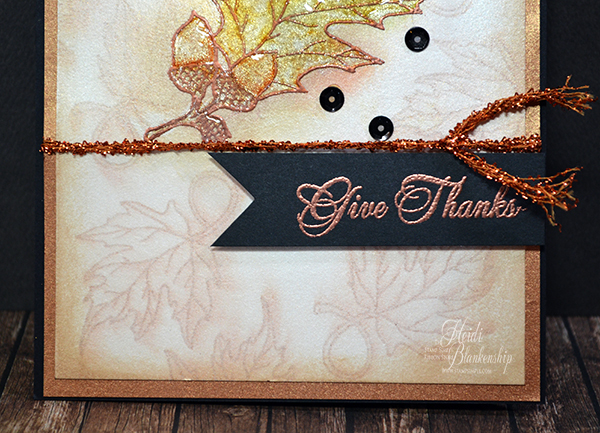 The sentiment is from the SS-009 Give Thanks stamp set. I cut the black paper down to size and I fussy cut the one end to look like a banner. 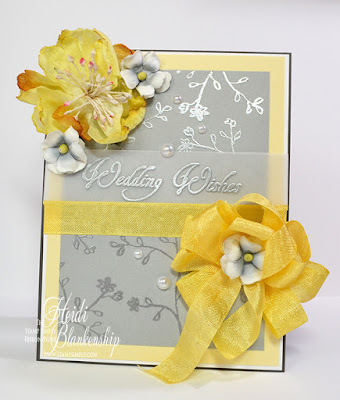 I added Therm-O-Web Foam Squares to the back of the sentiment to pop it up a little and add some dimension to the card. Please be sure to check out The Stamp Simply Ribbon Store for all of your paper crafting needs. And while you are there check out the new Autumn Release, metallic ribbons, Delicata inks and pearlescent papers. Don't forget to check out the Stamp Simply Blog for beautiful inspiration from the design team and a chance to win the giveaway! Thanks so much for stopping by today and I hope you all have a wonderful weekend! Hello blogging friends! Today, I have a fun masculine card to share with you. The card is filled with techniques and I also have a picture tutorial to share with you. Here is the card I designed using some of the Tonic Studios die templates and Birch BARC Wood Sheets with Adhesive Backing from ARC Crafts. The wood sheets are so fun to work with and they die cut beautifully. To start I used some of the Birch BARC Wood Sheets with Adhesive Backing from ARC Crafts and I die cut the guitar shape using the 1175E Rococo Electric Guitar Die. 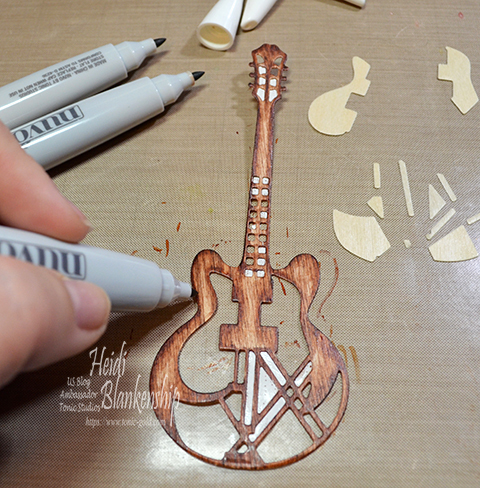 Next I removed all of the little bits and pieces from the die cut guitar. 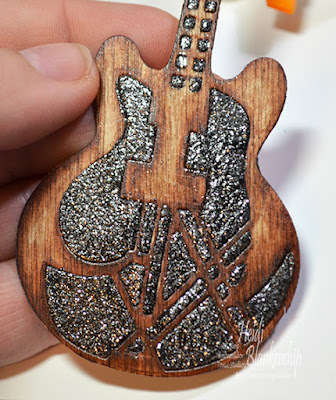 One of the techniques I used for the guitar is inlaid die cutting so be sure to save all of the little bits and pieces. 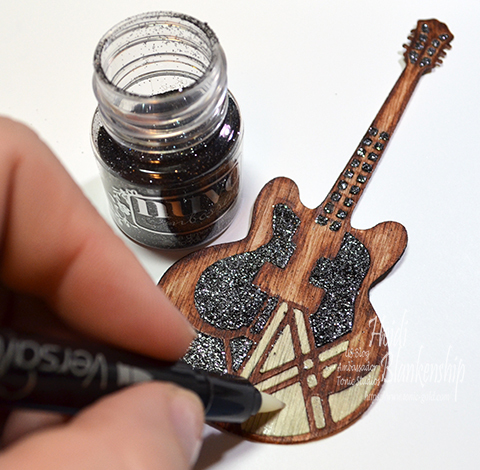 I used all three of the markers in the Creative Pen Collection - 317N Natural Browns to color the guitar. I started with the lightest color being 461 and then added the medium color 463. I added some of the darkest brown color 465 along the edges and then I went back with the medium and lightest markers to blend the colors. I love how the Creative Pens look on the Birch BARC Wood Sheets. The colors of the markers really make the wood grain pop. 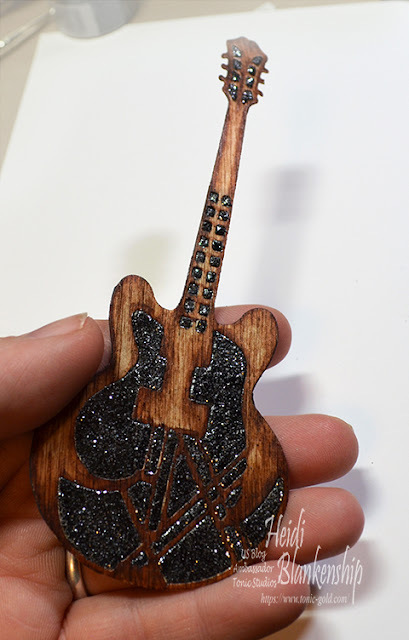 Next, I cut a few small pieces of black cardstock and removed the protective backing on the guitar die cut so the adhesive would be exposed and then I added the black cardstock to the backside of the guitar. Then I peeled the backing off of all the little tiny bits and pieces and placed them back into the die cut. Doing this is called inlaid die cutting. It takes a little time to do but I think the results are worth the extra time. I used a VersaMark Watermark Pen to go over all the inlaid pieces and then I added Embossing Powder 598N Glitter Embossing Powder - Noir and used a heat tool to melt the powders. Here is a close up of the finished guitar. One more close up. Here you can really see the wood grain. I just love how the guitar turned out! 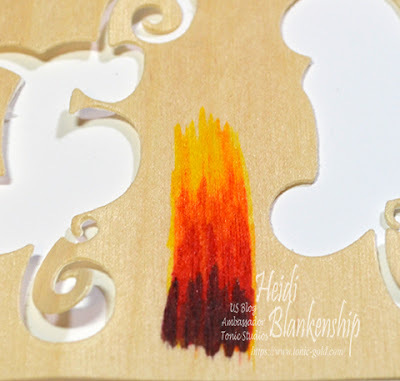 Be sure to save your left over pieces of the Birch BARC Wood Sheets and then you can use them to test out colors of markers or different products you might want to add. I used the 608E Duo Cap Initials Pretoria A-N Die Set and 609E Duo Cap Initials O-Z Die Set to die cut the letters from the Birch BARC Wood Sheets. The Initial dies are great becasue you get a two for one with the dies. 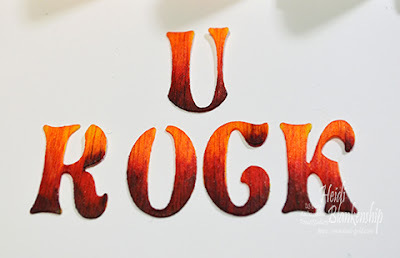 The letter is one piece and then there is the decorative outline. You can use the die cuts together or seperate. Gotta love dies that give you more bang for the buck! I used the Creative Pen Collection - 317N Natural Browns 461, 463, 465, 312N Sunshine Yellows 405, 311N Fragrant Oranges 391, 393, 310N Rich Reds 379, 381 and 313N Woodland Greens 417 to color the letters. I used the markers as shown in the picture going from lightest to darkest. You might notice the 417 marker from the 313N Woodland Greens collection. Green is a complimentary color to red so it works for the shading and blending at the bottom of each letter. Here is the close up of the letters. You can also see the wood grain on the letters. I wanted to add some shine to the letters but I didn't want them to be dimensional so I used a brush to apply the Crystal Drops - 677N US-Morning Dew. Then after the first coat was dry I added a little more just on the very bottom edge of each letter and then I applied Pure Sheen Glitter -706N Charcoal . 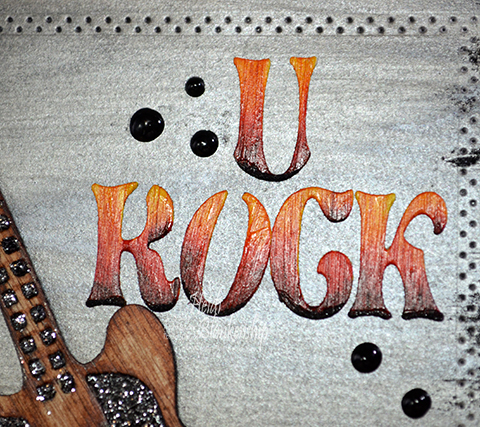 In the picture you can see the letters with a little bit of Sheen Glitter on the bottom edge. Here is a close up of the letters on the card. I added some 650N Gloss-Ebony Black Crystal Drops to finish off the card. 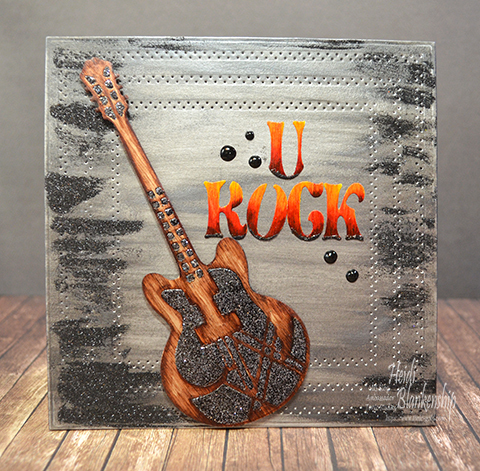 To create the background for the card I die cut some silver shimmer paper using the largest die in the 480E Square Layering Die Set. Then I used three of the dies from the 525E Pinhole Square Layering Die Set to create the pinhole design on the paper. I love the cool background design created from the pinhole pattern! Next I added some Embellishment Mousse 811N Black Ash to the paper. I just used my finger to apply the mousse and then I used a baby wipe to wipe off some of the excess. Then I used a paint brush and applied the Crystal Drops - 677N US-Morning Dew along the edges and then added Pure Sheen Glitter – 709N Charcoal to give the background piece some interest and added texture. To assemble the card I added the background piece to a black 5.5 x 5.5 top folding card base. Then I used Craft Tacky Glue to adhere the sentiment. 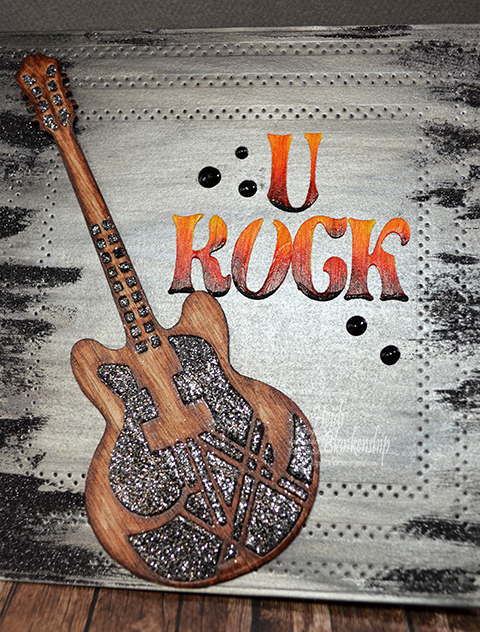 I added some foam squares to the back of the guitar for some added dimension to the card. I also wanted to mention for all of my paper cutting and die cutting I used both the Tim Holtz Paper Trimmer and Tangerine Die Cutting System. I hope you enjoyed today's card and the tutorial! Thanks so much for stopping by today! Please be sure to check out the ARC Crafts blog to see what they have created with the Tonic Studios products. Below there is also a list of ways you can get connected with ARC Crafts and follow them on social media—they have some fantastic products! Don't forget to check out the Tonic Blog too for more inspiration from the Design Team. Hello everyone! If you are a regular follower of my blog you know that today is my day to post for The Stamp Simply Ribbon Store. 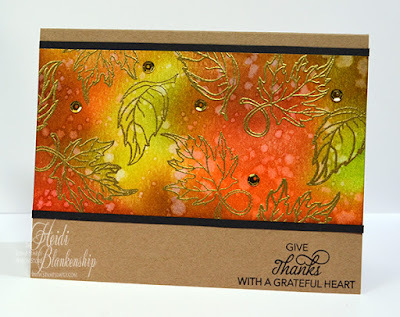 Next week all of the designers are going be participating in a week long event to showcase two of the new Autumn stamp sets from the Stamp Simply Clear Stamps Collection. But I am so excited to share a sneak peek with you today of the new Harvest stamp set! The Harvest stamp set is a wonderful set that includes six sentiments/verses and two beautiful leaf images. 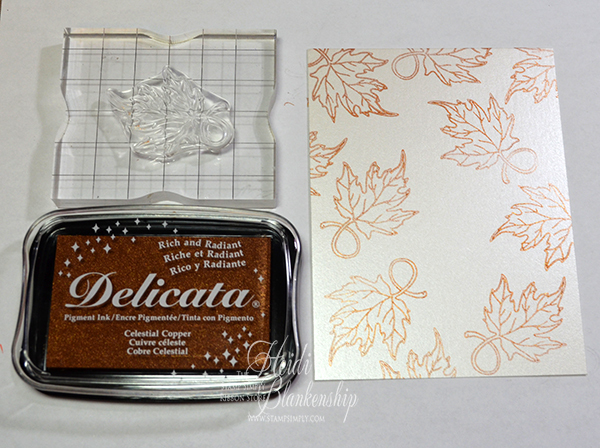 This stamp set will be perfect for the Autumn season along with Thanksgiving and to create wonderful thank you cards. 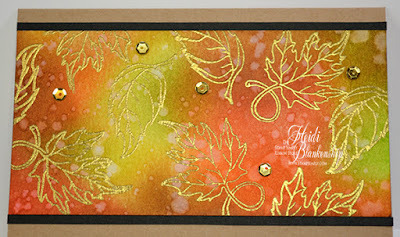 Here is the card that I designed using the Stamp Simply Clear Stamps - SS-010 Harvest stamp set. I just love the images of the leaves. I have kind of a mini tutorial to share with you so you can see how the colorful background was done. At first glance you might think it's a watercolor background but it's not. It's actually very quick and easy to achieve this look with a few colors of Tim Holtz Distress Inks, This would be a great card to make multiples of. I started with a piece of Ranger Watercolor Paper measuring 2-3/4 x 5-1/2 inches. Then I started adding the Distress Inks to the paper. I started with the lightest color and worked my way to the darkest. This is the color order I used--Twisted Citron, Peeled Paint, Spiced Marmalade, Ripe Persimmon, Fired Brick, Gathered Twigs. To apply the ink I used cotton balls. I inked up the cotton ball just like you would a sponge and then I worked in a circular motion starting off of the paper and working on to the paper adding color. I really like the soft and blended look from the cotton balls. Here is a close up of the ink blending. Next, I used clean water and a large paint brush to add the water droplets. The Distress Inks are made to react with the water. I let the water sit on the paper for a few seconds and then I used a paper towel to blot the paper and pick up the water. Next, I used a heat tool to speed up the drying time. I repeated the water droplets a couple of times until I achieved the look I wanted and I used a heat tool to dry the paper each time. Doing the water droplets on the paper gives it the look of watercolor. I used a heat tool to make sure the paper was completely dry before embossing. 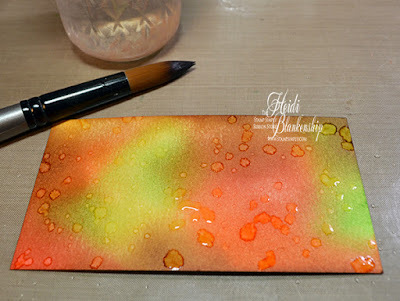 If you pour a little bit of embossing powder over your paper before stamping and it doesn't stick then you will know your paper is completely dry. I stamped the leaf images using VersaMark Ink. Then I added Ranger - Super Fine Detail Gold Embossing Powder and used a heat tool to melt the powder to give it the beautiful embossed look. Here is a close up of the sentiment in the bottom corner. I used Memento Tuxedo Black Ink to stamp the sentiment. 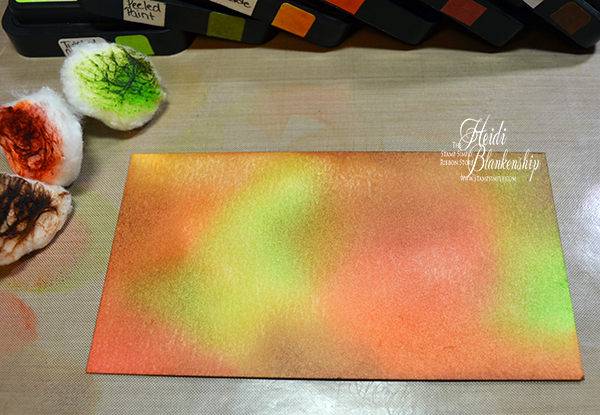 To finish the card I added the colored and embossed panel to the front of an A2 top folding landscape card. Then I added two thin strips of black cardstock to tie in the black ink from the sentiment. To add a little more sparkle I used Glossy Accents to add a few 5mm Gold Sequins. I hope you enjoyed the little sneak peek along with the card and tutorial for today! 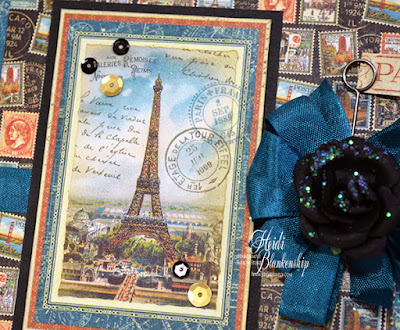 Please be sure to visit The Stamp Simply Ribbon Store for all of your paper crafting needs and to see more inspiration from the design team you can visit the Stamp Simply Blog. Don't forget to check the Stamp Simply Blog next week for the Stamp Simply Autumn Week featuring two of the NEW Stamp Simply Clear Stamp Sets. There will be lots of inspiration from the design team! Hello everyone! 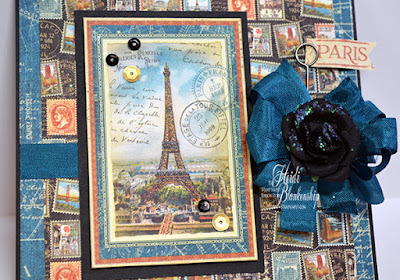 Today, I am posting a card for The Stamp Simply Ribbon Store. Yellow is a color that I don't use very often. 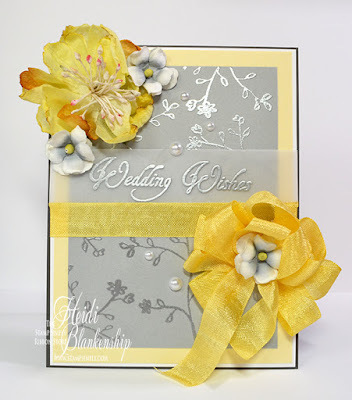 But awhile back I was looking around on Pinterest and I found some color combinations with yellow and gray. Ever since then I have been wanting to make a card using that color combination. To create this card I started with a light gray piece of cardstock and I randomly stamped the image with little flowers and leaves using VersaMark Ink and then heat setting with Ranger Super Fine Embossing Powder - Silver. The image is from the Altenew - Botanical Garden clear stamp set. 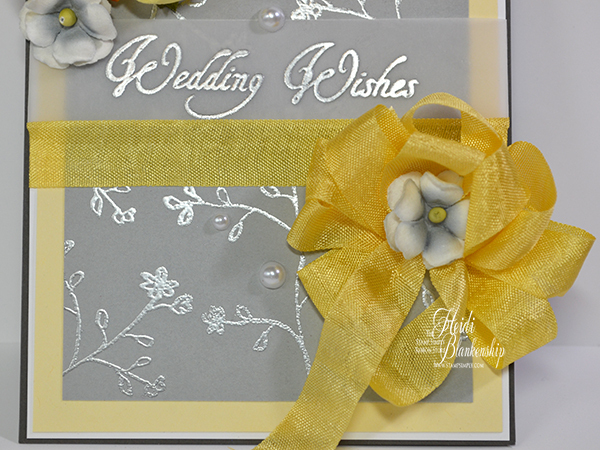 I love the look of the silver embossing on the light gray paper. Here is a look at the card from another angle where you can see the silver embossing. 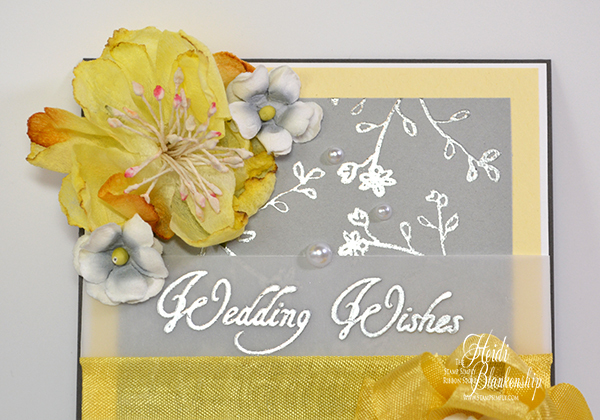 Next I stamped the wedding wishes sentiment from the Stamp Simply Clear Stamps - SS-Sent001 Wedding Wishes on to Vellum using VersaMark Ink, Then I added Ranger Super Fine Embossing Powder - Silver and used a heat tool to melt the powders. Here is a close up of the sentiment. I wrapped the Vellum around to the back of the card and taped it in place. Then I added some Antique Gold Seam Binding around the middle of the card just under the sentiment and I also added a bow. Here is a close up of the bow. I added all of the layers to a dark gray A2 top folding card base. Then I added a few Prima - Audrey Black/White/Gray Flower and one of the Petaloo - Botanica Collection Blooms Yellow flower. To finish off the cards I added a few Melissa Frances - White Pearls. I hope you enjoyed today's card. Now I wish I knew someone who was getting married that I could give this card too lol. 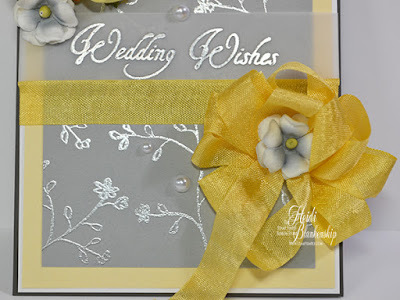 I think the color combination is so pretty especially with the silver embossing. Please visit The Stamp Simply Ribbon Store for all of your paper crafting needs. 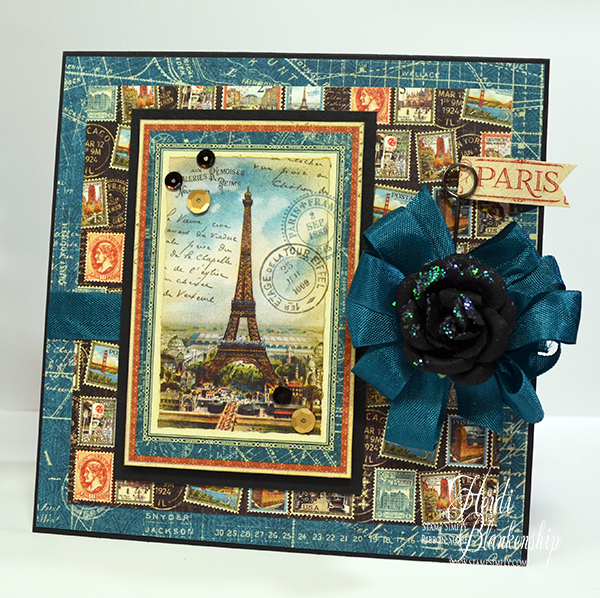 Don't forget the check out the Stamp Simply Blog for more inspiration from the design team. Thanks so much for stopping by today and I hope you have a beautiful Sunday! Just a quick post to share information for my upcoming sale. Products from several manufactures including--manual and electronic die cutting machines, dies, stamps, paper, ribbon, bling and lots of embellishments. Hello everyone and happy Friday! Today, is my day to post for The Stamp Simply Ribbon Store. I used some of the beautiful pattern papers from the Graphic 45 - City Scapes 8 x 8 paper pad. I know sometimes people will say they are intimidated by the papers and don't want to cut them. But I look at it a little differently. I think we can all agree the papers are gorgeous and I say let the paper do the work for you. Don't be afraid to cut it! :) The paper pads always have great cut apart images and you can make that your focal point. 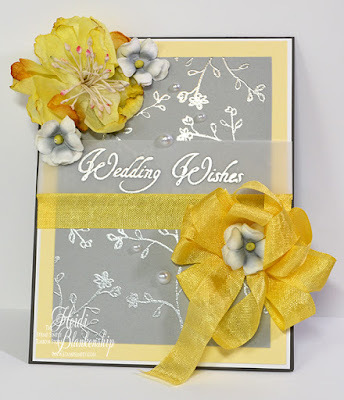 Then add some papers to layer the card, ribbon, and some embellishments and you will have a beautiful card in no time. 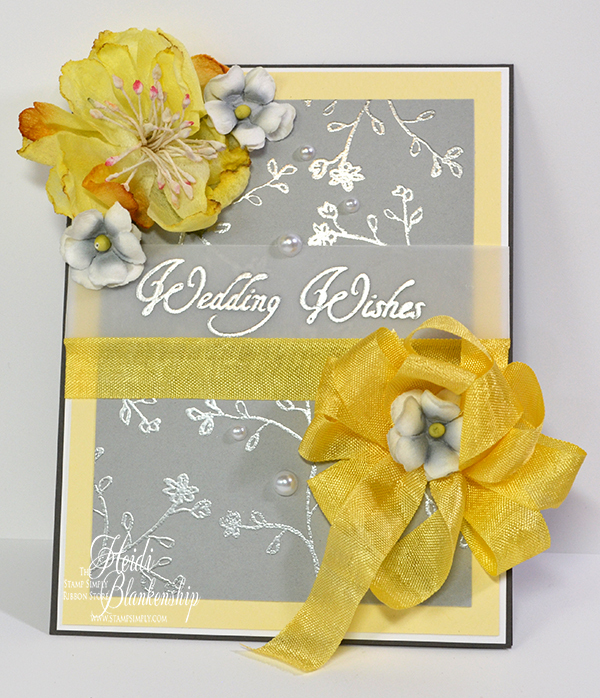 Here is the card I designed using the Graphic 45 - City Scapes 8 x 8 paper pad. I fussy cut the focal image of the Eiffel tower and then I layers a piece of black cardstock behind it. I used some Therm-O-Web Foam Squares in between the layers for some dimension. Here is a close up of the Eiffel tower image. I know it's a little hard to see in the picture but I added some Zig Wink of Stella Clear Glitter Brush Pen on the Eiffel tower for a bit of sparkle. I also added some Hazel & Ruby - Shine & Sparkle Gold Sequins and Darice - 5mm Black Sequins. I added a couple more layers of pattern paper in the background and then I added a Noble Peacock Seam Bindings bow on the side of the card with a Prima - Interlude Black/Gray Flower in the center of the bow. I fussy cut the word Paris with a banner end and added that to a Tim Holtz - Memo Pin. 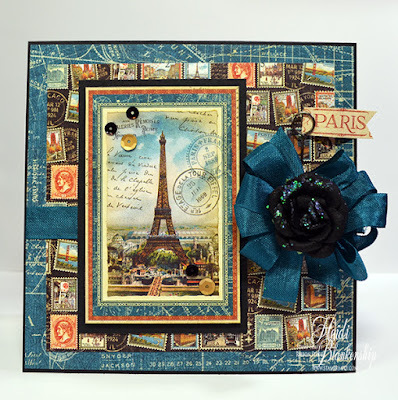 Please be sure to visit The Stamp Simply Ribbon Store for all of your paper crafting needs and be sure to visit the Stamp Simply Blog for more inspiration from the Design Team. Thanks so much for stopping by and I hope you have a wonderful weekend!